IT professionals agree that vital information is required in order for a service provider to adapt to the ever changing dynamic needs of the business. Best practice tells us we should create a culture of ongoing continual service improvement (CSI). In order to propose strategies for service improvement plans that will allow us to meet the ever changing demands of our customer we need to get a pulse on what is really happening in our internal and external environment. Taking a SWAG at it is not good enough. Data, information and knowledge are not enough. A service provider needs to provision the measurement systems that will enable success. In comes “Feedback Loops”. A Negative feedback loop brings you toward your target set point to optimize and sustain an internal stable environment. An animal maintains homeostasis or a stable body temperature through negative feedback loops. Humans use a negative feedback loop to maintain a body temperature of 98.6 degrees which is our internal target set point. We see this when our body is over heated and produces sweat to cool us down and also when the body produces goose bumps to warm us up. Both are a means to move us toward our target set point. Your body is consistently monitoring, measuring and reporting via negative feedback loops to sustain a stable internal environment. Defining Critical Success Factors (CSF) for our strategies and for our processes in ITSM is a good starting point for determining what is required in your measurement system. Key Performance Indicators (KPI) allow us to quantify the CSF’s for targets. These KPI’s make tangible our target set point. Having a target set point can enable the service provider to scope the depth and breadth of measurement and ensure the target set point is stable. Using targets or set points in a closed loop system allow for appropriate thresholds, vital reporting, and most importantly set the tone and direction for all cross functional teams in the value stream. 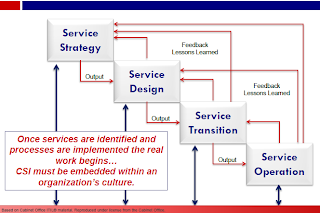 The service provider and the business are able to work lock step together toward the same common goals and outcomes. In the same way that an animal uses homeostasis to sustain stable internal body functions through multiple complex systems, a service provider can use nested feedback loops to sustain consistent performance while adopting and adapting to dynamic business requirements. We get real-time information, scoped effort, and the means to automagically self-correct for ongoing continual service improvement. With negative feedback loops we speed up or slow down based on a target set point. We the service provider become dynamic in order to shift or change to meet customer demand. If negative feedback loops are positive then what about positive feedback loops?